I am thrilled you stopped by! 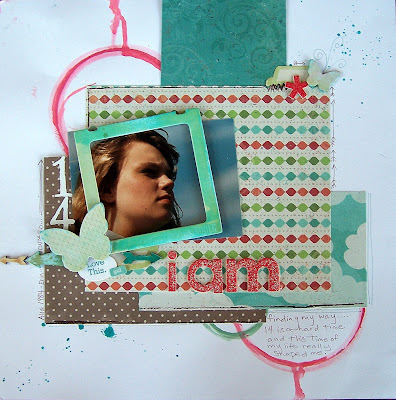 I am an avid scrapbooker and spend all my free time creating my scrap-dungeon. Of course, that's when I'm not at the dance studio with Dolly, reading and drinking diet coke or planning my next Disney vacation. I would love to talk to about anything under the sun and you can contact me about my blog at cuttleyc523@rogers.com. Inspiration Elevator November 2014: Layer It On! One More Time for Inspiration Elevator! Inspiration Elevator August 2014: 30 minutes or less! Authentique Challenge at Two Peas! You may recall that the purpose of this challenge group is to take our scrapbooking to the next level, to stretch our creative process and to grow as artists by embracing challenges that make us think, work and grow. You can view all of the challenges our new Inspiration Elevator Blog, here. "I have been thinking lately, that I have only done one layout of my childhood and realized that maybe some day, my kids or grandkids would enjoy looking at a few more pages and learning about my siblings, my parents and I. So my challenge for you this month is to create a page about a childhood memory of yours. It can be a good, a bad, a funny, a photoless or whatever you choose kind of layout. Just remember to add journaling to tell the story behind your childhood memory. Can't wait to see your projects!" Lisa, makes a very good point in her challenge..how many of us take the time to create pages about ourselves for our children or future grandchildren? I admit to being more than guilty. For me, one of the biggest reasons is that the old pictures of me don't often inspire me creatively and the new digital age brings so many options for creating great photos as the foundation for my pages. Secondly, I hate to journal. I do. I hate trying to formulate the ideas or memories in coherent words and then to put them on my pages it always seems to mess with my design (wait and see!) Old memories need journalling but I guess the argument can be made that NEW ones do too. But, alas, this is what IE is all about...the challenge, the boundaries, the idea to push oneself into the uncomfortable to create (possibly) something amazing! So here it is! I began by using an old jar lid covered in watercolour paints to make the circular shapes and let them drizzle of the page. I even added a flick or two of turquoise as well. 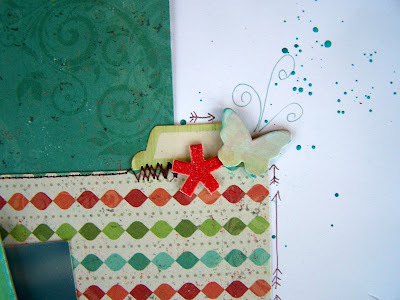 I layered the patterned paper from We R Memory Keepers and machine stitched them. I even added some Studio Calico butterflies distress with a sanding block and smudged with watercolour paints to create flow and direction in this upper right corner. The doodles were an after thought but I think I like them. They are all over the design in little bits..let me know what you think! Finally, the title and the journalling: STRESSFUL!!! I don't usually struggle with titles as a few tried and true methods usually work perfectly..but this time it didn't flow. Finally, I decided to not write as I did above in my post, I just left the strong emotion out of it...I wrote about being 14 and struggling to find my way. It eased the pressure a bit and I suppose those feelings about my Dad will just live on here for me ...and for all of you. I hope you have enjoyed this little bit of me and my memories. I hope you will play along with us and be challenged to dig a bit into your own memories. Maybe you to will find something that was meaningful and bring a happy tear to your eye. I know you've talked about an awol mojo, but seriously, when you HAVE to make a page, you KILL IT! This is a super page - I love your rings, doodles, and photo of a very reflective young woman. And goodness, you haven't changed a bit - beautiful as ever! Love that number tucked vertically alongside the photo too. WTG my friend! What a great photo and I think you should print out this blog post and tape it to the back of the layout. :) Beautiful thoughts. Just beautiful!! I love your doodling! i use to doodle all the time, and I find I have gotten away from it! You rocked this page... VERY cool!!! 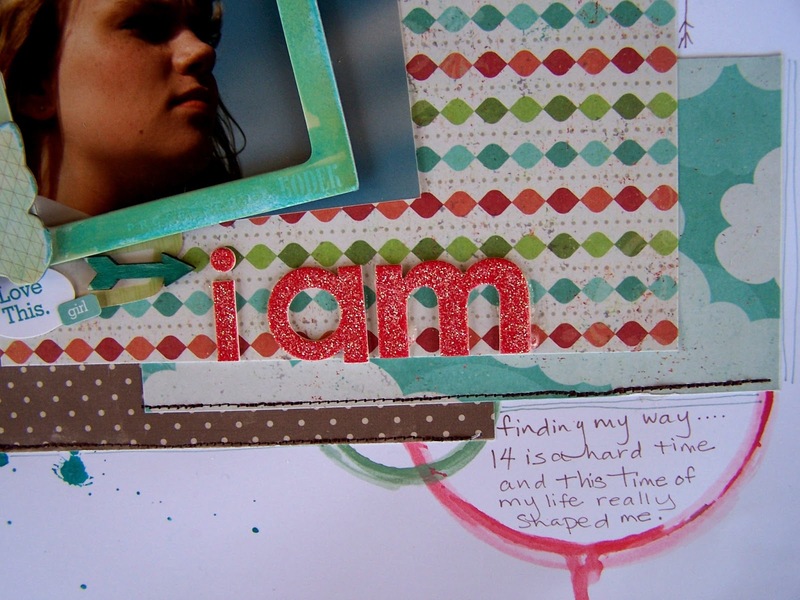 I love your photo, stamped paint circles and yes, your doodling! Fabulous take on my challenge Christa! Yup, made me tear up too! Love the water colour technique and your colour combo. You can never go wrong with turquoise, I think! love all your little details and love what you wrote on your blog, you should add this to the back. gorgeous work, my friend! What a wonderful post! Thank you for sharing a little piece of your childhood and feelings with us. Your page is just lovely. Using a jar as a stamp for paints is such a creative idea. I love the colours and the little details. LOVE the title and the emotion pouring from this one.....that's what it's all about. What a beautiful page Christa! !